Port Vell is a gorgeous waterfront harbor that everyone should visit at least once when they are in Barcelona. The port is home to many attractions, with one of them being the Imax theater. Once a person has explored the port, they can go to the theater to watch the latest movies. The Imax Theater is large and comfortable. The Barcelona Aquarium is located in port Vell, and this particular aquarium is one of the largest aquariums in all of Europe. This aquarium has many different types of sea animals, such as turtles, crocodiles and so forth. There are even sharks that can be seen at the aquarium and there is a long subterranean tunnel that you can go through and observe some deep sea creatures that live in the Mediterranean. This is a very large place, and one should expect to spend several hours here. This building is actually the only warehouse that survived throughout Port Vell’s history. The building was built by Elies Rogent, and was completed towards the end of the 19th century. Today, the building no longer serves as a warehouse, and there are plenty of things to do inside. There is a massive museum located within the building, and there are quite a few different seafood restaurants that people can go to. There are also offices located inside. If you manage to visit the Palau de Mar, then make sure to go out to eat at one of the restaurants. It is also recommended that you visit the museum, as you will be able to learn a lot about Port Vell, from its early beginnings to modern times. This building can be found not too far from the Old Port Authority building, and it is actually the old customs building. This particular building was built in the early 1900’s. The exterior of the Aduana building is amazing to look at, so if you visit this place, make sure to bring a camera so you can snap a few photos. 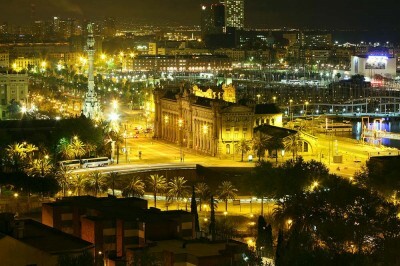 This attraction can be reached by crossing a wooden pedestrian bridge that connects the inner city of Barcelona with what is called the Moll d’Espanya. This is where there is a wide range of things can be found. There are many things to do during the day, but fans of the nightlife will find that the Maremàgnum offers some of the best nightlife in all of Barcelona. There are many shops located here, but there are also many cinemas that people can visit and there are plenty of discos. There are also bars and restaurants located here.